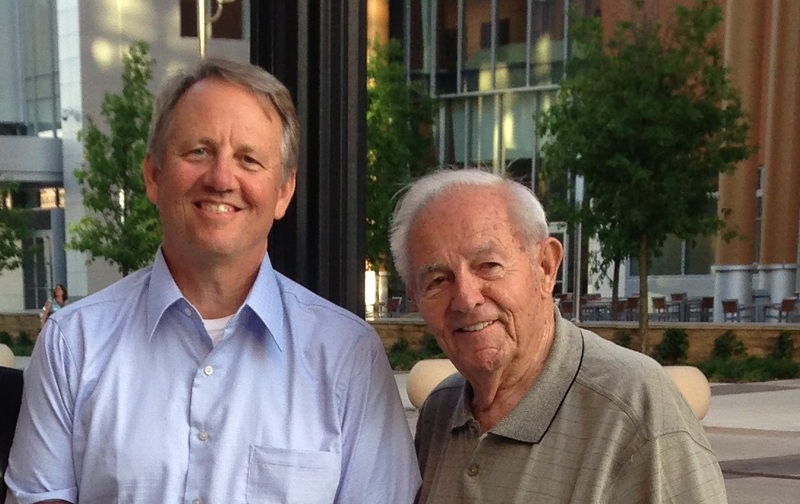 There is so much I want to say at the death of my father – an amazing, kind, gentle and loving man. I could point you to the several hundred word articles written about his life after he died that were published in local papers and social media. I could point you to a beautifully done TV news story about his time with FDR at Warm Springs, GA, when he was a 7 year old boy, that aired on the day after he died. When my dad was diagnosed with some significant heart problems in the last few days of his life I really thought I would have some weeks left to be in his presence. I had already decided that for Father’s Day I would publish a poem that I wrote for him 15 years ago on my blog. It seemed to be even more true after the ensuing decade and a half since its creation. Instead, the Father’s Day recognition was offered as a brief Eulogy for him at his funeral on Wednesday, June 8, 2016. While I hope the images of a “parent/child” relationship are universal enough for anyone to appreciate, there is one stanza that was written out of an experience that only a handful of people witnessed, and so I will share that experience with you here so you may listen to the poem with greater clarity. The summer after my freshman year in college, when my dad was serving in the Tennessee State Legislature, he and his colleague and good friend, Rep. Jack Burnett, took their families to Nassau, Bahamas, for a week at Paradise Island Resort. In addition to me, my high school aged sister and my junior high aged younger brother were present. The Burnett family included two daughters that were about my brother’s age. Upon checking in at the hotel my dad asked the clerk if he could recommend a good “family oriented” show that we might experience. “Of course! The ‘Bahamian Review’ is in our own hotel and it includes dinner and a great floor show!” the clerk replied. “And it is ‘family’ oriented?” my dad confirmed. A couple nights later the two families, dressed in our fine dinner wear, were seated at a long table that accommodated the dozen of us. The table butted right up against the stage, so one could not ask for a better seat in the house. After a wonderful meal the house lights went down, the show orchestra began the overture. Spotlights swirled around the large room full of dinner theater attendees and as they swept across the stage I sensed something was moving from the ceiling above. My brother was sitting with his right shoulder against the stage, and I was directly across the table from him. As the stage lights began to come up, I looked above to see two giant bird-cage-like contraptions on each end of the stage and in addition to the feathers and glittered costumes there were two beautiful women wearing nothing from the waist up! As this situation became apparent to the rest of the table I could see my mother “look” at my father with a: “this is a FAMILY show?” look in her eyes. The only way my brother and I could avoid the tension between my mother and father (and the embarrassment of having all the young females in our group see our blushing faces) was just to keep staring at those cages and those naked women inside them. As I shared with the family and friends gathered for my father’s funeral, when I told this story there, if looks really could kill, then we would have all been gathered in the summer of 1974 for my father’s funeral, and we would have been begging his friends with political connections to get permission for his widow and (our mother) to be released from jail (where she was being held for justifiable homicide) long enough to attend the funeral. My life is full of fun stories because of my dad. My life is full of good memories and deep wisdom because of my dad. I am grateful and glad. But today my heart hurts in realizing this is the first Father’s Day in 60 years that I will do it without my Dad. and look somebody in the eye. not a single black eye. that to mirror yours would be OK.
to pass these lessons to my own. of what I learned from you.